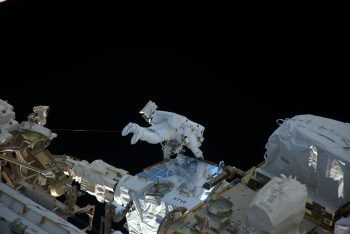 On Friday 24 March NASA astronaut Shane Kimbrough and ESA astronaut Thomas Pesquet will head outside the International Space Station for their second time as a spacewalking duo. It is the first in a series of three spacewalks in the coming weeks – Shane will return outside with NASA astronaut Peggy Whitson and then in April Peggy and Thomas do a last sortie before the end of Expedition 50. 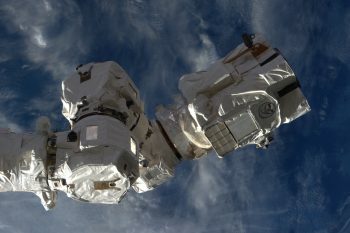 The two spacewalkers will spend almost seven hours disconnecting cables from a docking adapter, lubricating the tip of the robotic arm Canadarm2, inspecting a radiator and replacing cameras. They will also install an upgraded computer to allow future commercial crew vehicles to dock with the Space Station. Friday’s cable work on the docking adapter (called the Pressurized Mating Adapter-3 or PMA-3) will prepare it for its relocation from the Tranquility module to the Harmony module on March 26. The relocation opens up the Tranquility port for the future installation of the new International Docking Adapter-3 set to be delivered on a future cargo mission. Watch the whole spacewalk live here from 10:30 GMT (11:30 CET) and follow @esaspaceflight for live Tweets on the day itself. 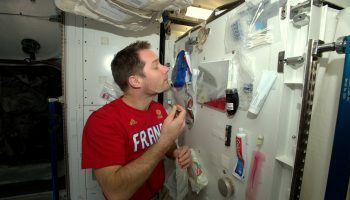 Thomas and Shane will start breathing pure oxygen at around 07:00 GMT to purge their bodies of nitrogen – their spacesuits operate at lower atmospheric pressure than the Space Station so much like scuba divers they need to avoid nitrogen building up in their blood and causing “the bends”. The duo will climb into their their spacesuits with Peggy helping. Thomas and Shane are scheduled to head outside at around 12:00 GMT. Shane will be EV1, wearing a spacesuit with red stripes while Thomas will be EV2, wearing a spacesuit without stripes. 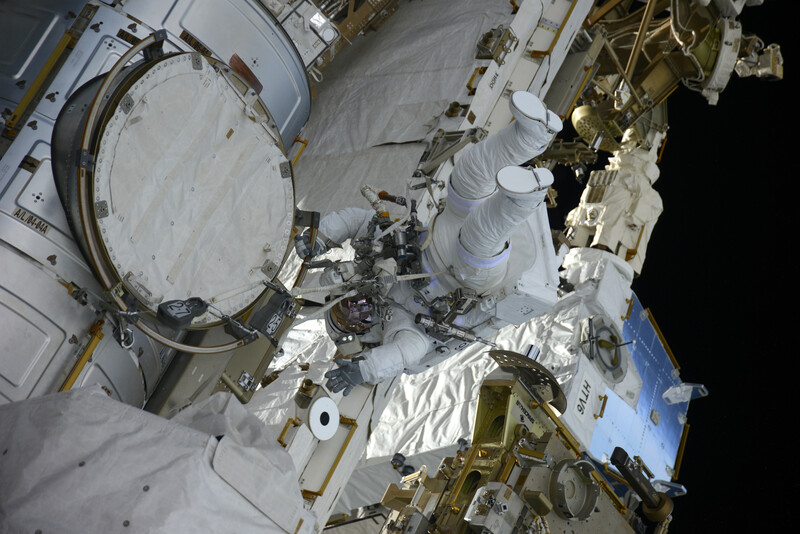 Shane and Thomas will spend the whole spacewalk working separately on their own tasks. Shane will move to the “S0 Truss” and start installing the new computer relay box while Thomas will move to the “P1 truss” section and start inspecting a small leak in the Station’s cooling system. Shane’s first task is to replace one of the computers that control all aspects of the International Space Station’s systems, called the EPIC MDM for Enhanced Processor & Integrated Communications (EPIC) Multiplexer/Demultiplexer. When Shane is finished with this task that is expected to take around 90 minutes he will move to the Pressurised Mating Adapter-3 on the Tranquility module (also called Node-3). PMA-3 is a docking adapter for visiting spacecraft and Shane will uncouple it so it can be moved by robotic arm to another location on the Space Station. This task is expected to last 75 minutes with Shane unplugging cables and releasing bolts and adding end caps to the freed cables. When he is finished Shane will return to the airlock to change equipment. Shane’s schedule will then take him to the Japanese Kibo Laboratory and retrieve two external camera units. 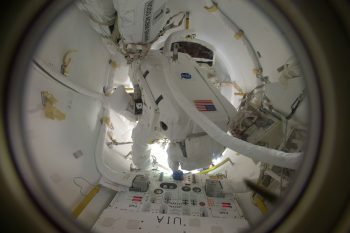 The lights on them need replacing but this can only been done inside, so Shane will loosen two bolts on each camera and return them to the airlock. Thomas will leave the airlock and head to the “P1 truss” segment to inspect a radiator that has been slowly leaking ammonia for years. This is not an issue but ground control has noticed that the leak is increasing so they want Thomas to inspect it. The Robotic External Leak Locator detected the possible location of the leak when it went outside through the Japanese airlock a few months ago. Now Thomas will try to pinpoint the exact source. Thomas will look for the leak in junction boxes, rigid lines and flex hose jumpers. He will take photos and pat and touch the system while searching for the leak. This task is planned to take 105 minutes. 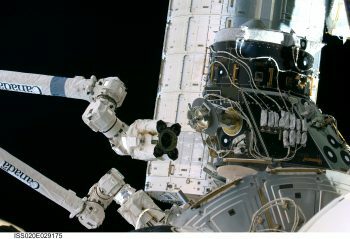 Thomas’ second task will last almost four hours and will see him maintaining the end of the Stations’ robotic arm in space agency terms this is the SPDM/LEE which stands for “Special Purpose Dexterous Manipulator, Latching End Effector” – as Thomas himself says “or in clearer terms: the hand of the robotic arm”. Thomas will lubricate the latches at the end of the arm to ensure smooth operation in the future. 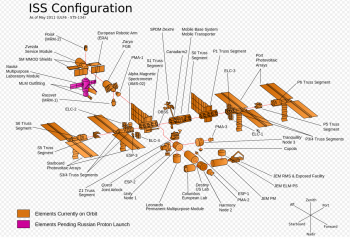 Thomas will perform this task at the S0 truss. As spacewalks are complicated and time-consuming there are always extra tasks planned in case the astronauts have more time on their hand. If time allows, extra tasks include installing handrails, replacing a light and a lens cover amongst other things. As Thomas and Shane will spend the whole day working on their own areas they will not be able to do the tried and tested buddy-check system where they check each other’s suits and progress and can help in case of emergency. For this spacewalk extra attention has been paid to any emergencies and how Thomas and Shane can quickly come to each other’s aid if need be. All these operations will take around six hours and 20 minutes to complete, when the spacewalkers will return to the airlock. During this time there will be no food and no toilet break. Water is supplied in a pouch with a drinking straw. The work is tiring as the astronauts fight against the pressurised suit that becomes stiff in the vacuum of space. A spacewalk is a test of patience and alertness. Throughout the spacewalk they will check their suit and especially their gloves for wear and tear. 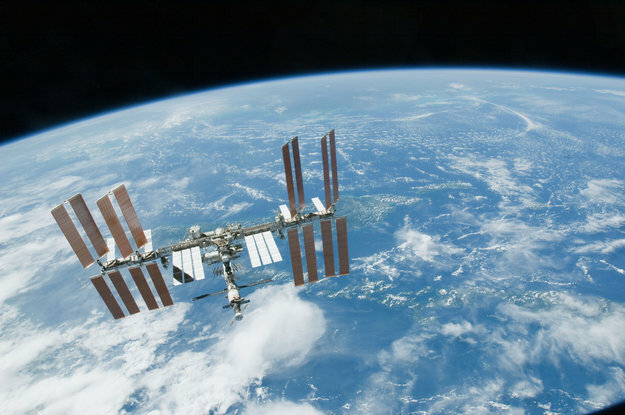 Every 90 minutes the Space Station orbits Earth so Shane and Thomas will be continuously working 45 minutes in daylight and 45 minutes in complete darkness. The spacesuits have lights for the dark moments, but as the Sun rises it can be blinding for moments. After a 25 minute clean-up and further checks the airlock repressurises in around five minutes. Inside, Peggy and Sergei Ryzhikov will be waiting to welcome them and help them out of their suits. The spacewalk is scheduled to end at around 18:00 GMT. Extraordinaire ! Merci ! À demain ! Champagne au frais ! Je vous admire pour ce travail incroyable. Quel courage ! Je vous admire.En ayant lu tout que vous allez faire,j’ai un peu peur pour vous ! Merci de nous faire vivre ces moments extraordinaires ! C’est bon pour moi de savoir qu’il se passe des “choses” géniales la haut ….MERCI,MERCI MILLES FOIS !! Et bon retour ! Bonjour Thomas Pesquet!On sait que tu sors aujourd’hui de la station. On se demande comment c’est la vie dans l’espace. Tu nous fais rêver. Je suis une citoyenne francaise et guyanaise. Notre département FRANCAIS est bloquée, les routes, les institutions, les écoles, commerces, pour démontrer le ras le bol de la population qui se batte contre l’insécurité, la vie chère, l’enclavement, l’énergie, ect…TOUT EST BLOQUE !!! Nous souhaiterions que vous couvriez cette actualité, que vous relayez en métropole ce blocage générale. Merci pour votre aide, nous avons besoin de vous, aidez nous à nous faire entendre. Passez vous au dessus de besancon un de ces jours?? Congratulations. Wishing you always the very best.